I’m so excited to announce the Cheeky Churn Dash Quilt Along! I’ve been wanting to host a quilt along for a long time now, and I thought the Cheeky Churn Dash would be the perfect pattern to make! You can RSVP for the quilt along to sign up for weekly updates and get insider tips and tricks with bonus material. I love quilting, but it’s so much more fun to make a quilt with a fun group, right? Why join a quilt along? I don’t know about you, but sometimes when I start a project, I need a little more motivation to finish. Sewing with a group of quilters and sharing our progress together will give you inspiration and answer any questions you might have while making your quilt. I like to know when I make a pattern that I’m going to have some help, and quilt alongs are a great way to get that support! This quilt along will take place on Instagram using the hashtag #cheekychurndashquiltalong. Use this hashtag when you post your weekly progress so others can see your awesome progress (and you’ll be able to see what everyone else is doing)! Also, you might be thinking…good grief. This is right at the beginning of the school year? Why??? I know. I was a high school teacher in my past life. I get it. I planned this quilt along with that in mind–I know everyone has busy schedules. There’s a catch up week included in the quilt along, and I’ve divided the steps up into very doable tasks, even if you have a very limited schedule. You can click over to the original Cheeky Churn Dash Post to read more about it and my inspiration for making this quilt. I just finished making another Cheeky Churn Dash with Alison Glass Sun Print 2018, and I’m loving the gem tone colors in that one! This pattern is great for showing off your favorite fabric collections or going purely scrappy. Not sure you have the skills to make this quilt? That’s a question I used to ask myself all the time when I started quilting. If you are able to sew a consistent 1/4″ seam allowance and cut your fabrics fairly accurately, you’ll be fine! And if you aren’t comfortable with those things, you’ll never learn if you don’t try. 6 years ago, I didn’t even know how to thread a needle, much less use a rotary cutter! 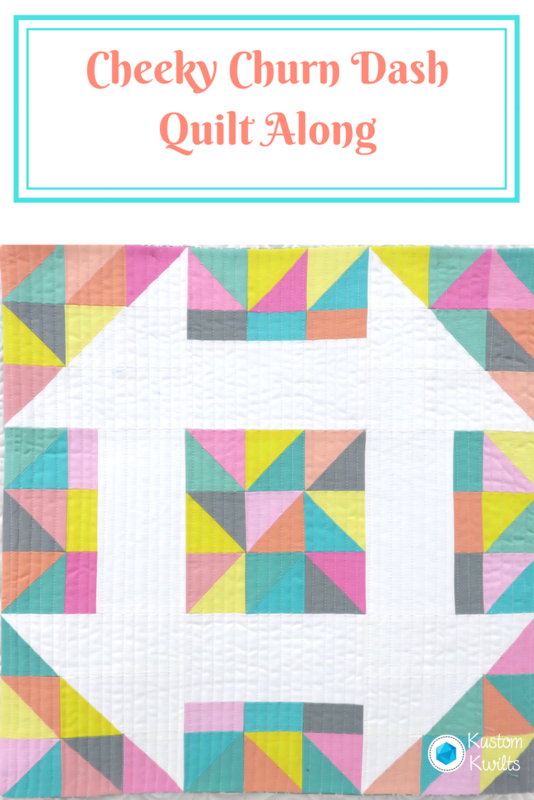 Quilt alongs provide great community for asking questions and discovering new tips and tricks you might not have known before. You’ll get to practice your 1/4″ seam allowance AND I’m going to show you Beth Helfter’s Accordian Sewn HST™ method for sewing half-square triangles. It is an absolutely BRILLIANT technique that you’ll find yourself wondering how you ever did without. You can always use your preferred method of piecing HSTs, as well. You’ll also get tons of inspiration from other participants in the quilt along. 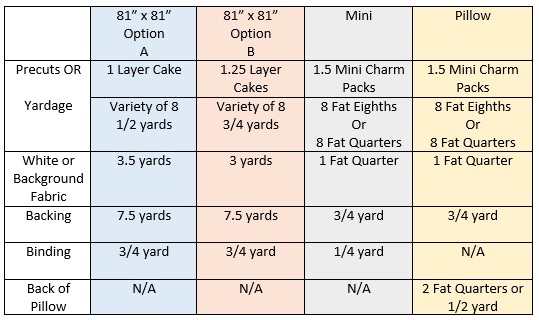 Select the option you want to make and go fabric shopping! Jennifer at Knotted Threads on Etsy has joined in the Quilt Along fun to bring all Cheeky Churn Dash QAL participants a 10% discount on fabrics purchased from her shop! She has a great selection of current and modern fabrics, so you’ll want to take advantage of this 🙂 Use the coupon code: CHEEKYCHURNDASH at checkout. RSVP for the quilt along, gather your pattern, fabrics, and materials and introduce yourself using the hashtag #cheekychurndashquiltalong. I’ll be randomly picking one winner from week one (you have to post on instagram with the hashtag) to win an awesome prize! Starch fabrics if needed (you won’t need to do this if you plan on using Beth Helfter’s Accordian Sewn HST™ Method. Cut all fabric according to the option you are making. Draw one diagonal line on the backs of the squares we’ll be using to make half-square triangles if using the Accordian Sewn HST™ Method. Assemble the half-square triangles and press. Square up the half-square triangles to 9.5″ square for the quilt size and 2.5″ square for the mini and pillow sizes. Assemble sections 1, 3, 7, and 9. Catch up week if you’re behind! Sew the quilt top together! JOIN THE QUILT ALONG UPDATES! There aren’t many rules for this quilt along, unless you want to be considered for giveaway prizes. There will also be some awesome giveaways sprinkled throughout the quilt along, so be sure you post one picture to your Instagram account of that week’s progress before the next week’s starting date in order to qualify for prizes (see the schedule above for specific dates). There will be one grand prize winner at the end of the quilt along for one lucky person who completed and posted their quilt top (must be the 81″ x 81″ version) by November 16, 2018. You’re still in the running for the grand prize, even if you missed posting throughout the quilt along, so long as you post your finished quilt top to your Instagram account by November 16. The giveaway prizes are only for US participants and cannot be shipped outside the US. Sorry! Thank you for joining in the fun, and I can’t wait to start sewing with you! I’ll see you in the quilt along! 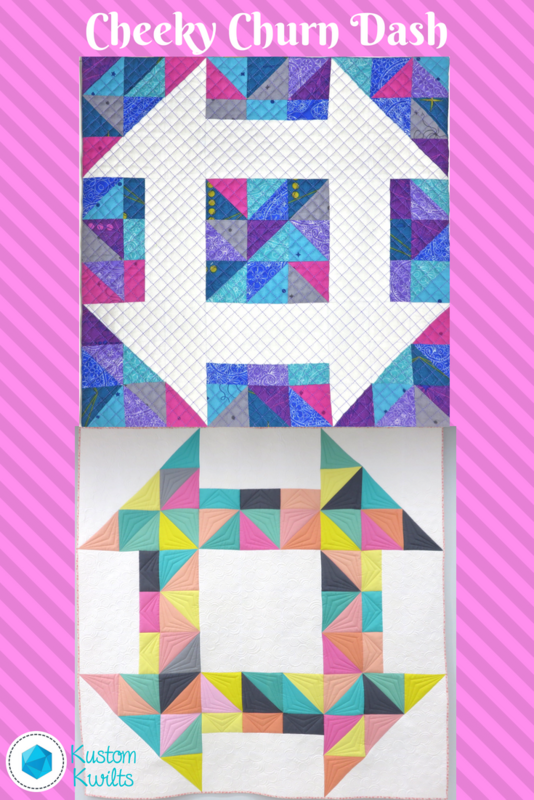 Next post: Build-A-Block: Are you ready to try THE die cutter? I love Churn Dash quilts!